Buick uses that "hyper strut" in some of their new applications. So far the only nice pictures of this type of suspension I have found is from Honda. Tried Ford and the newest Camaro but no bare suspension pics. Buick is a good idea, will have to do some more searches. Really just looking for spindle possibilities. The Buick system looks very promising and best of all they have been making these suspensions since 2010 I think so parts should be available at a wreckers. Thanks Will. Do a search on member 4thfiero. He has a turbo LE5 with Alphafab engine management. I'm the original owner of a white ' 84 2M4 purchased Dec 10, 1983 from Pontiac. Always garaged, no rust, 4-wheel drifts are fun! Yes that is the thread. Reading some bad stuff about alpha fab lately you should stay away from them. There are lots of other engine management suppliers around and engines like the LE5 can be had in wrecking yards. The LE5 is a larger 2.4 L—2,384 cc (145.5 cu in)—version of the Ecotec. Both the 88 mm (3.5 in) bore and 98 mm (3.9 in) stroke are larger, and Variable Valve Timing on the intake and exhaust improve low-end torque. Compression is 10.4:1. Power is 164–177 hp (123–132 kW) and torque is 159–170 lb·ft (215–230 N·m). The engine uses a reinforced "Gen II" block. Connecting Rods are GKN Forged C70 Powered Metal from July 2007 on. The differences (i think) can be attributed to testing and reporting of results. But any of them would be a huge upgrade from my increasingly tired Iron Duke. Best of all they are matched together by GM so lots of parts such as flywheels and clutches are available. The differences in power levels were mostly due to the exhaust systems used in the various platforms. The design of some of these vehicles meant the exhaust was just naturally more restrictive. 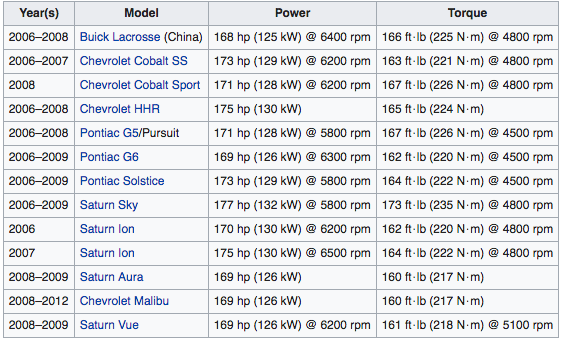 In the case of the LE5 in general you want the older ones that were used in the Solstice/Sky or the Cobalt SS non supercharged. That will guarantee you get the forged crank and connecting rods. GM made the engine in to a cheaper version in later years without the forged internals. Any stock Ecotec engine, LE5 or L61 will run the wheels off even a pristine stock V6 Fiero. For a performance upgrade over either stock Fiero engine, I think any Ecotec is a great choice.